Chief Minister Pema Khandu today held a meeting with Bogong Bango Kebang (BBK), Parliamentary Secretary Kaling Moyong and top forest officials to discuss on proposed establishment of a new market complex at Pasighat, Arunachal Pradesh . The new proposed market complex was announced by Chief Minister during the Mega Solung celebration at Pasighat in 2016. During the meeting, the Chief Minister requested the forest officials to take up the diversion of 15 ha of forestland with the Ministry of Environment and Forest (MoEF&CC) for construction of new market complex. 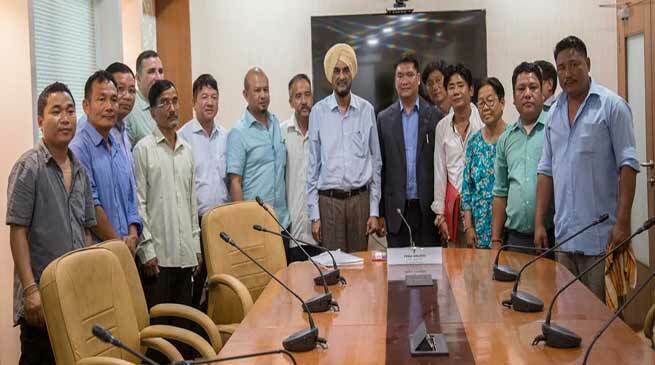 He requested them for strong recommendations for diversion as the existing market area in Pasighat is congested and will require new area for expansion. He also said, as Pasighat is qualified for smart city, new lands would be required.